The next scenery from DAI-Media is LRTR - Timisoara in Romania. The full name of LRTR is "Timișoara "Traian Vuia" International" and it is situated in Ghiroda, Timiș County in Western Romania. I am a big fan of DAI-Media's work and their LEVC - Valencia Manises ( ) is one of my favorites that I have used constantly since its release. So anything coming out of this excellent studio is well worth checking out. 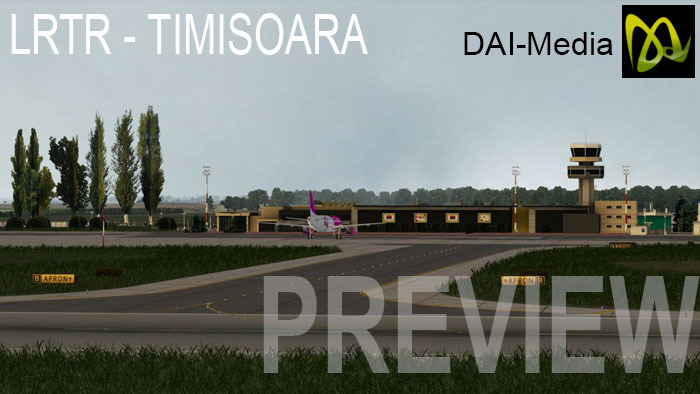 DAI-Media have released preview images of the coming release of LRTR - Timisoara. The Terminal building modeling is exceptional. Full terminal areas are covered, and the detailing is very good. Here in LRTR they are trying out even better new elements and animation on hanger doors and other special effects. The airport is a operating base for Wizz air, so certainly LRTR will be worth checking out when it is released which is very soon. Other sceneries that are noted in progress by DAI-Media are : Aeroport Castello - LECS (not to be confused with Seville) which will be a free scenery! And another coming soon is a worthy one to certainly wait for is... Barcelona–El Prat Airport - LEBL.